infrared) technology ensures long-term accuracy, stability and reliability. Comes in a hard carrying case with four AA batteries. Air Temperature °C range: -10–60°, resolution: 0.1, accuracy: 0.6°C. 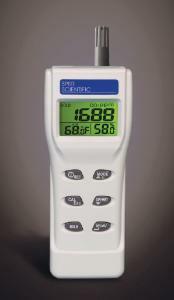 Air Temperature °F range: 14–140°, resolution: 0.1, accuracy: 0.9°°F. RH range: 0–100%, resolution: 0.3, accuracy: ±3%. Dew Point range °C: -13.3–60°, resolution: 0.1. Dew Point range °F: 8–140°, resolution: 0.1. Wet Bulb range °C: -73.4–60°, resolution: 0.1. Wet Bulb range °F: -100–140°, resolution: 0.1. 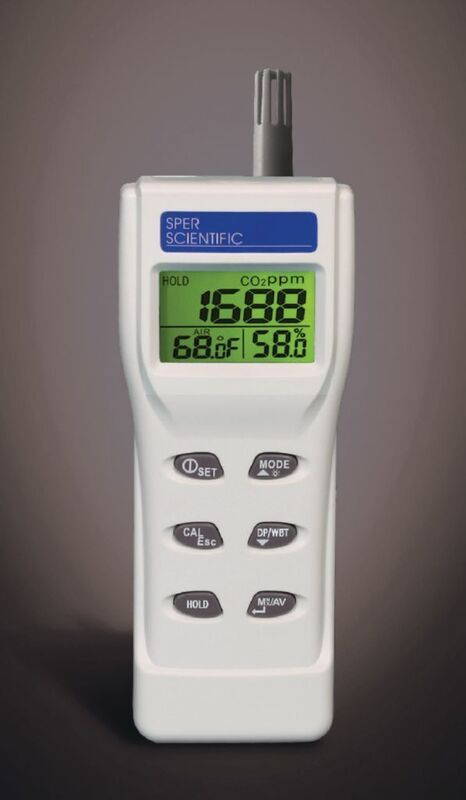 CO2 range: 0–5000 ppm, resolution: 1 ppm, accuracy: ±30ppm/ ±5%rdg. Size: 8 1/4" x 3" x 2 1/2"; weight: 10oz.